H12-Media review -CPM ad network. Today i am Going to review h12 Media cpm ad network which is one of best paying network in CPM advertising Industry.It provides sliding banners,embeded Video ads,standard banner ads,Popup ads,popunder advertising and on video banner advertising. with Less payment Threshold and quick payment options.Also Serves Quality traffic for Valuable advertisers with low deposit requirement.So read this article for H12media review for advertisers and Publishers. 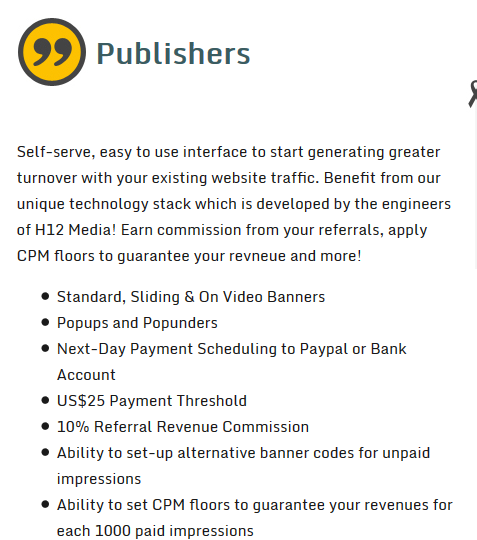 Its time to Boost your websites Revenue by Using h12 media self serve platform.Using their Great technology stack created by their engineers.you can also use their Cpmfloor technology to maximize your ad revenue.also make some extra income by referring your friends or family to their network. 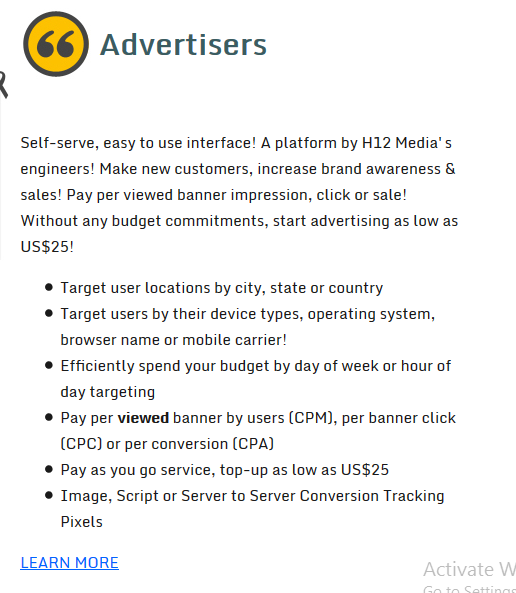 H12 media advertising is global advertising network which provides high quality advertisements that are useful to your visitors.It also Connects you to worlds biggest RTB marketplaces to create high revenue by premium campaigns.Easy to use self serve platform for ease of generating reports,operating your websites,setting payments & getting paid. h12 media provides 2 different ad serving options. The 1 st option is floor pricing also called as Floor Pricing.Where you can set min cpm Rate you want to sold your traffic. They will buy your ads at your specified price or more. The 2nd model is Fullfill option in this option 100% fill rates offered to publishers.In this case there is no min rate limit.But h12 media will not accept too low bids and send it back to your backup banners. Multiple Ad formats that fullfill your advertisements needs. H12 media offers Different ad formats for your desktop and mobile traffic.00x250, 728x90, 160x600, 320x50 (mobile optimised), 120x600, 336x280, 300x600 and 468x60 are the available sizes. Don't affects your website loading speed. The ad network that will not affect your page loading speed HTTPS enabled adserver H12 tags do not affect your page speed at all, thanks to Their ASYNC banner loading technology. Malware and Virus free ads. h12media serves clean and safe traffic to your visitors.As it will not contain any malwares and Viruses.Campaigns are compatible with Mobile devices.No popunders and redirects. In terms of cpm rates h12media ads pays average rates.As it serves only banner ads.So you will get average 0.30$ per 1000 impressions. and upto 2$. You can expect 0.10$-0.40$ rates in general. H12 Media does not provide a fixed CPM rate, base CPM rate or fixed CPC for campaigns in your account. CPM rate can be different for any website according to country traffic, click rates, conversion rates and content channel (Content type you serve) information, campaigns, competitors on your website's traffic, etc. We prefer not to give an average about your CPM rate. Here is Earning Report showing their H12 rates. 20$ for paypal & 500$ for WIRE. 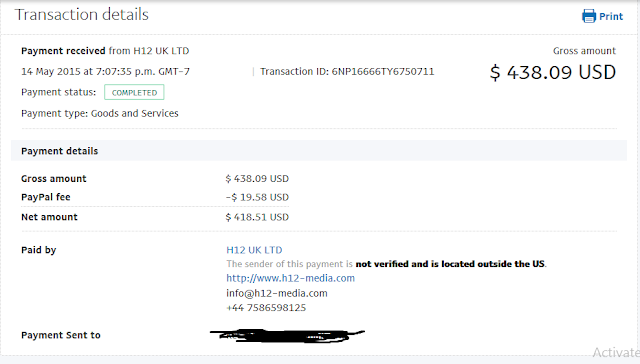 H12 media have a very good referral program through which you can make some extra money by just referring your friends and family members to h12 media ad network. you will earn 10% lifetime commission. H12 media review for Advertisers. Hello friends generally i use to review ad networks for publishers but in this post i am also giving some advertisers benefits of h12-media. Read More about h12 media for advertisers.